One thing I can’t stand? A sore throat! It’s truly miserable, especially for kids. I keep the ingredients on hand to make this herbal sore throat spray when sickness hits, but there’s nothing like a hot cup of tea when you’re down and out. 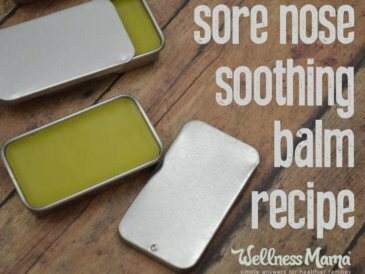 Especially if it’s a sore throat tea made with natural ingredients like marshmallow root, licorice root, lemon, and honey. 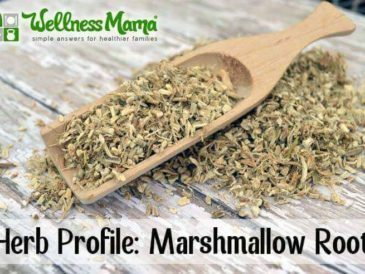 While not everyone has marshmallow and licorice root around, my advice: don’t wait until the next sore throat… stock up now or you’ll wish you had! No, I’m not talking about the white sugary treats (although I do have a healthier-for-you homemade version I don’t object to). Marshmallow root is high in mucilage (think slimy) and is perfect for coating sore throats. It also helps things like stomach flu, stomach ache, and diarrhea that can sometimes accompany sickness. It’s an expectorant and good for dry coughs as well. 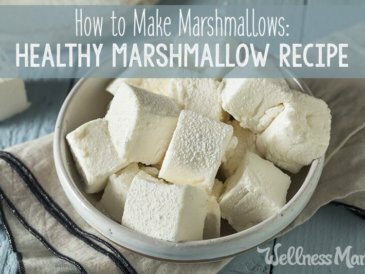 Read about the benefits of marshmallow root here. The jury is out on whether marshmallow root is safe for children under age 3. 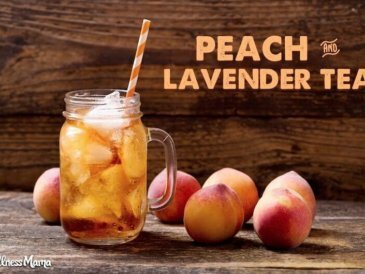 Some herbalists say it’s safe and some say to avoid it (according to an assessment done by the European Medicines Agency in 2009), so you may want to skip this tea for really young kiddos. Since my kids eat marshmallow root in (homemade) marshmallows, I feel comfortable giving it to them in tea form as well. I even give it to them when sick in the form of elderberry marshmallows. Theoretically marshmallow root may inhibit the absorption of drugs, so to be safe take it 1 hour apart from medications. Cultures have used licorice root as a medicine for thousands of years throughout the world. This popular, sweet-tasting herb restores, relaxes, and softens. It’s an adaptogen to help the body cope with stress, which is vital during times of sickness. Like marshmallow, licorice is a soothing demulcent (something that encourages mucus production) making it perfect for dry, spasmodic coughs. It’s also an expectorant that helps the body expel junk from the lungs. 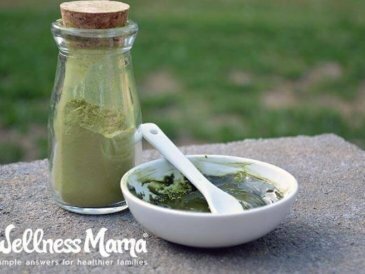 Because it’s antiviral and immune-boosting, many recommend using it for pneumonia, flu, and respiratory viral infections. 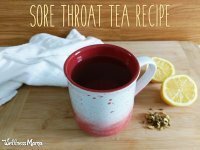 Licorice helps make other herbs used in a formula more effective and is best when combined with other herbs as it is in this sore throat tea recipe. Licorice has been nicknamed the children’s herb because of its appealing sweet taste and gentle nature. However, licorice should not be used in those with high blood pressure or heart problems unless approved by a doctor or natural health practitioner. It’s also not advised for use during pregnancy. If you fall into one of these groups, consider trying deglycyrrhizinated licorice which has the constituent removed that can cause issues. This type is safe for those with heart issues and during pregnancy, but it’s not an antiviral. If you’re pregnant or nursing it’s always a good idea to okay any herbal remedies with a health professional first. A throat soothing tea featuring marshmallow and licorice root for fast relief of a scratchy throat. Place the marshmallow root in a jar with a lid (mason jars work well) and cover with 1 cup warm, filtered water. Be sure the water isn’t hot! Put it in the fridge and let it steep for 4 hours or overnight. Put the licorice root into a pot along with 2 cups of water. Bring the mixture to a boil, then reduce and simmer with the lid on for 10 minutes. Strain the tea into a quart sized jar. When the licorice decoction is very warm, but no longer hot, stir in the honey, lemon juice, and marshmallow infusion. Sip warm as needed for a sore, dry throat. This can be stored in the fridge for up to 6 days and reheated as necessary. Be sure to check with your natural health care practitioner before use if you fall into any of the categories mentioned in the herbal info sections above. For adults, take about 1 cup three times a day. For children, adjust the dose to about 3/4 cup twice a day. Can’t I Just Throw the Herbs in a Pot? Nope. Marshmallow works best when it goes through a cold extraction. Licorice is a hearty root, so a simple 5-minute steep time won’t release its beneficial properties… it needs to be simmered for a minimum of 10 minutes (called a decoction). It’s not quite as simple as recipes that just throw everything in together, then voilà, tea, but it’s still easy. 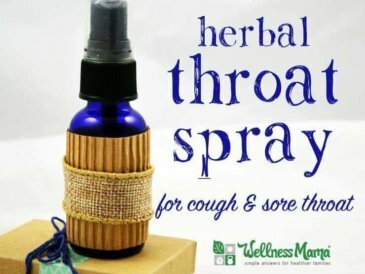 When a sore throat strikes, I use the herbal throat spray first and make this tea for later in the day. You can also buy a store-bought herbal sore throat tea, but the long steep is still recommended. What are some of your favorite ways to soothe a sore throat? Leave a comment below!